A Louisiana exterminator was called to destroy a massive hornet's nest in a shed armed with just a shovel and a GoPro. See video. (PATTERSON, La.) — Jude Verrett is one brave man. The Louisiana exterminator was called to destroy a massive hornet’s nest in a shed at a home in Patterson, located about 90 miles southwest of New Orleans. Armed with a GoPro camera, Verrett documented being attacked by thousands of angry, territorial hornets as he pulls apart their home and destroys it with a shovel. 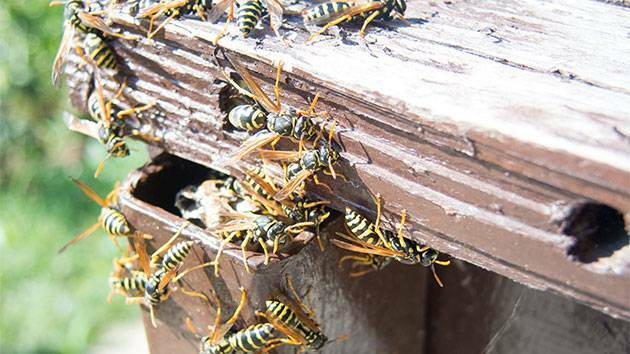 “We got here, what I would say, is the granddaddy of all hornet’s nests, European Yellowjacket,” he said in the video. Although he wore protective gear head to toe, Verrett admits he is still a bit uneasy. “Actually, I’m not usually scared,” he said before the unnerving sound of swarming hornets drowned out his words. As Verrett tore the nest apart, a dizzying number of hornets are seen swarming around and bouncing off the camera lens.